We join Innovate Finance at London Tech Week! 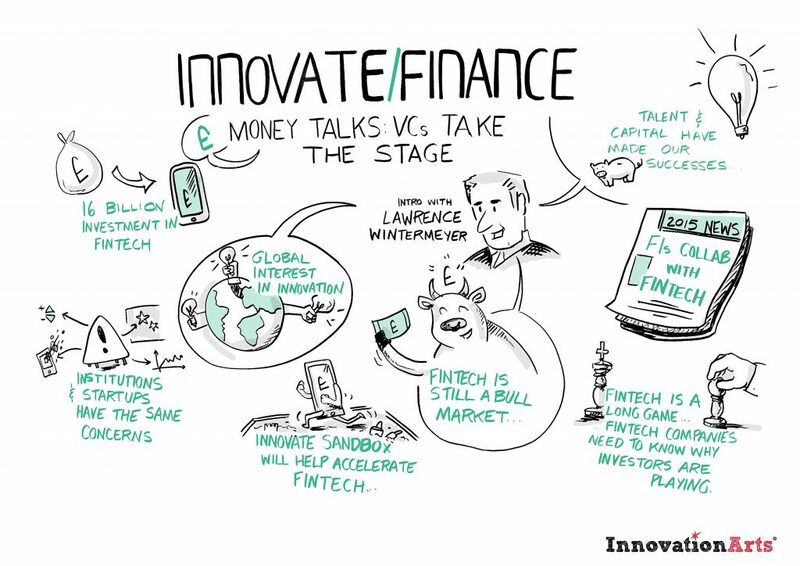 We just got back from scribing for Innovate Finance’s “Money Talks: VCs Take The Stage”. Reversing the usual order of things, the event had VCs making pitches to start ups rather than the other way around. The reversal is indicative of the changing investment climate for Fintech, the fastest growing industry in the UK. Many start-ups are sceptical of Venture Capitalists and investors backed by large institutions. The nature of their business allows start-ups to get prototypes off the ground without huge investment backing. However, as the industry grows, working with a larger institution can offer its own rewards. Insight, managerial support and infrastructure are as useful to start-ups as money and VC’s are willing to offer expertise as well as capital. As a highlight of London Tech Week, the talks made clear that banks and VCs are taking greater notice of Fintech. It’s a booming market with increased investment, at the forefront of innovation. As one of the UK’s strongest business prospects, we are sure to see Fintech start-ups grow quickly from their humble roots. We sent Jordana to scribe the output of the day through graphic recording.